For MM4 connections, the “Server Address” field should contain an IP address or host name of the MMSC. This field can also include a port number in the format, hostname:port, where “25” is the default port if a port number is not explicitly specified. 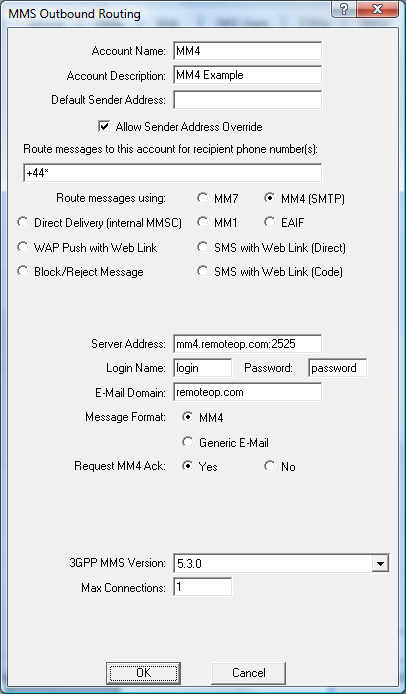 The “E-Mail Domain” field specifies an e-mail domain that should automatically be appended to phone numbers when routing via this MMSC connection. “Login Name” and “Password” are optional parameters that should be used if the MMSC is to use “SMTP Authentication” when transferring messages using this MM4 connection. “Message Format” should be set to “MM4” when connecting to another MMSC. It can be set to “Generic E-Mail” for situations where the connection is not using the true MM4 protocol (this option omits MM4 specific headers which could cause confusion for connections that are not true MMS). “Request MM4 Ack” specifies whether or not an acknowledgment of receipt should be requested from the receiving operator (this is not an acknowledgment of final message delivery, only an acknowledgment that the MMSC has received the message via MM4). Normally, this setting should be enabled, however it may be disabled if there are problems receiving acknowledgements from the other operator or service provider.